Crystal Couture Inc. is concerned about your privacy and the security of your personal data. We have made a strong effort to ensure that your personal information is safeguarded. This notice explains our online information practices and the choices you can make about how your information is collected and used. It discloses the privacy guidelines for all Crystal Couture Inc. websites including www.crystalcoutureinc.com. This notice is available on our homepage and on pages where personally identifiable information is requested. We may ask for your name, e-mail address, phone number, address, age, type of business, customer number, credit card number and expiration date. We may also request personal preference information that is needed to register or subscribe you to services or offers, or make product recommendations. Information about our customers is an important part of our business, and we do not sell it to others. Name, address, phone number, customer number, and credit card information are used to ship and bill orders and for our own future marketing purposes. In addition, phone number and customer number are used in case there is a problem with your order and we need to contact you. Personal information allows our websites to make product recommendations to you. If you provide us with your e-mail address, you may receive periodic e-mail promotions and special offers from us. We also gather data on visitor's movements through our sites. This information is used to improve our service to you and to administer our websites. Data on visitors' home servers is aggregated for internal review. The aggregate information on what pages are visited is used to improve the site content and also for error tracking purposes related to the functioning of the site. Individually identifiable e-mail addresses are not captured or stored for future use, unless you choose to communicate with Crystal Couture Inc. by posting a message to CrystalCoutureInc.com. In any communication, be sure to include your name, mailing address, and customer account number. Persons who communicate with Crystal Couture Inc. and therefore supply Crystal Couture Inc. with an e-mail address may receive future communications from us by e-mail. You can unsubscribe at any time by e-mailing your request to [email protected]. Simply state, "Do not email" in the body of the message. All internal/external Crystal Couture Inc. parties, such as employees, agents, and contractors are similarly bound by these privacy and security policies. Finally, please note that we also offer links to other third party sites and services. Be aware that these outside parties operate under their own privacy and security policies, and Crystal Couture Inc. has no responsibility or liability for these independent policies or actions. 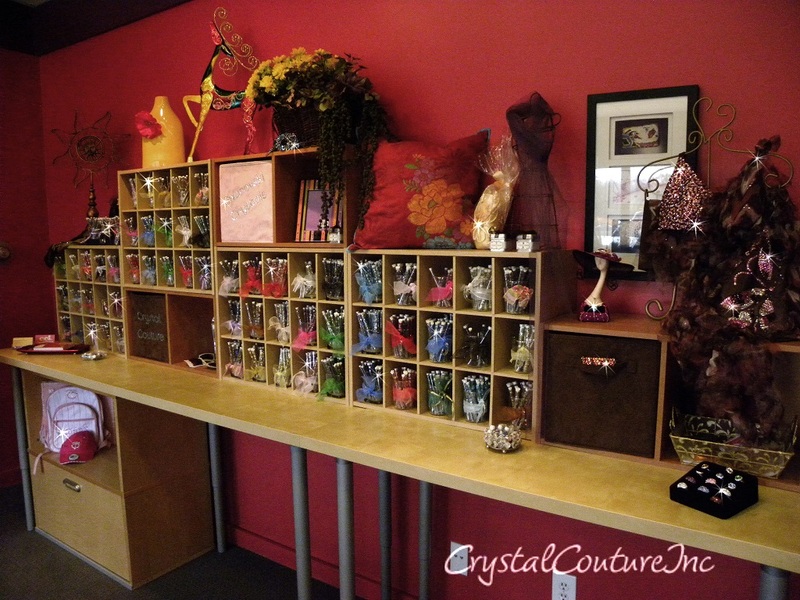 Third Party Marketing is defined as a company that has no direct relationship with Crystal Couture Inc. customers. Third parties will not contact you as a result of your subscribing to our e-mail newsletter and promotions lists except through advertisements within the newsletters themselves. Crystal Couture Inc. is committed to the security of information collected on our sites. To prevent unauthorized access, maintain data accuracy, and ensure the correct use of information, we have put in place appropriate physical, electronic, and managerial procedures to safeguard and secure the information we collect online. Private account information is located behind a firewall; it is not directly connected to the Internet. Information behind the firewall on the customer server is not available to unauthorized computers. The firewall is a recognized industry standard. Encryption is a process by which we use software to scramble sensitive information while it is in transit to Crystal Couture Inc. We use Secure Socket Layering (SSL). SSL technology is the industry standard for secure online transactions. It is based on a key that has two different parts: public and private. The public part of the key is distributed to those you want to communicate with. The private part is for recipients' use only. When you send personal information to us, you use our public key to encrypt your personal information. That means if your information is intercepted during the transmission, it is scrambled and very difficult to decrypt. Once we receive your encrypted personal information, we use the private part of our key to decode it. Making a credit card purchase online at Crystal Couture Inc. is just as safe as making a credit card purchase over the telephone. However, if you would prefer to use the phone, just call 1-866-476- 1030, and one of our product specialists will gladly take your order (10 am - 5 pm CST, Monday - Friday). Protecting the online privacy of the very young is especially important to us. For that reason, Crystal Couture Inc. voluntarily complies with the Children's Online Privacy Protection Act of 1998 and the US Federal Trade Commission's Children's Online Privacy Protection Rule. (16 C.F.R. Part 312). We neither collect nor maintain information at our site from those actually known to be under the age of 13, nor is any part of any of our sites directed to children under the age of 13. To make buying from us simple, shipping and handling within the contiguous U.S. is free of charge for orders over $75. Please contact customer service for Alaska, Hawaii and International shipping costs. If you need a faster delivery, you can arrange for overnight or second day delivery. Contact customer service for more information and costs. Most products are ready to ship within two days of your order, while others are (as in the case of custom designs) manufactured when you place the order. Once your order is placed, shipping date(s) will be e-mailed to you. Reference our shipping section for more information. • Please understand Crystal Couture cannot accept returns after 30 days from shipping date. • Products eligible for return or exchange must be new, unused, unaltered, complete and contain all original product packaging and accessories (no returns or exchanges accepted on consignment costumes). Products must be repackaged properly, in the original packaging. Products not in original condition will not be accepted for return or exchange. • Any items that are returned for credit are subject to a 15% re-stocking fee. Items that returned for exchange are not subject to the re-stocking fee. Shipping charges for the exchange will be charged to the customer. • Contact Crystal Couture customer service @ at 1-866-476-1030 (Monday – Friday, 10 am – 5 pm CST) for a Return Authorization Number prior to returning the product. Products will not be accepted without an issued Return Authorization Number. • Indicate your Return Authorization Number on the packing slip and include the packing slip with your return. • Returns must be shipped prepaid and insured. If the return or exchange is due to a Crystal Couture error, Crystal Couture will pay for the cost of shipping and handling. Please contact Crystal Couture (toll free at 1-866-476-1030, Monday – Friday, 9 am – 5 pm CST) for return authorization and instructions. Please contact customer service toll free at 1-866-476-1030 for cancellations. We pride ourselves on error free shipping, however in the event you received damaged or missing merchandise, we will make every effort to resolve the issue as quickly as possible. Be sure to notify both the carrier and CrystalCoutureInc.com within 24 hours of delivery of any issues. Please keep all shipping and packing materials. We appreciate your trust in us and want to make your shopping experience with us easy, successful and fun! We welcome your suggestions on new or different products we can offer, how we can improve, and techniques that you have used and would like to share with others. Enjoy! © Crystal Couture Inc. All Rights Reserved.